This dual-shock, fully coupled suspension features a simple and effective flip-lever torsion spring adjustment to quickly adapt the suspension for one-up or two-up riding, or for hauling a heavy payload. A pair of 36mm High Pressure Gas (HPG) shocks provides controlled and consistent performance. 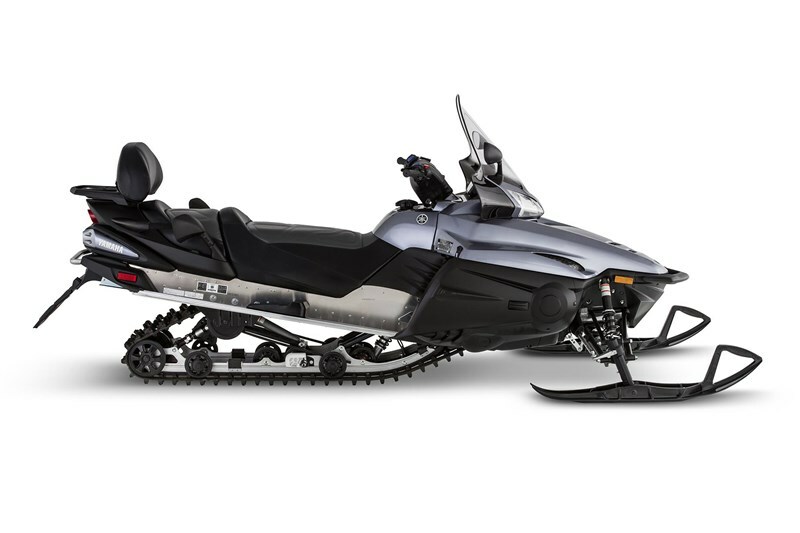 Often referred to as the “original” 1049 Genesis, this three-cylinder, carbureted classic has been the foundation of snowmobiling’s 4-stroke revolution and delivers silky smooth power and year-after-year of dependability. A wide and plush two-up seat provides comfortable seating for both driver and passenger. A integrated passenger backrest delivers additional support and security for passengers. Utilizing many of the same premium suspension components found on other models, the mated, plush coil-over shocks are tuned to deliver a soft, comfortable ride. Developed exclusively by Yamaha engineers, the Tuner II Ski incorporates a dual keel design that can be calibrated through various runners and carbide lengths for rider preference. The Tuner II Ski dramatically reduces darting and steering effort while retaining predictable and sharp handling characteristics. Yamaha utilizes an engine braking reduction system for a “free-wheel” feeling on deceleration. The system allows a small amount of air to flow through the intake system upon throttle release, thereby dramatically reducing the engine braking effect typically association with a four-stroke engine. Regarded as the best high-Performance terrain track available, the 151 x 1.25-inch lug design of the RipSaw II delivers incredible acceleration, braking control, and handling in a wide variety of conditions. Seamless and easy to use electric start delivers instant and hassle free starts, no matter the weather, eliminating the need for an “old-school” pull rope. You’ll also enjoy the convenience of an effective and simple to use reverse system, includes a helpful alert beeper so you always know when reverse is engaged. In addition to a host of on-board creature comforts and storage, a standard factory rear mounted tab-type tow hitch is at the ready for additional gear or occasional light-duty hauling. High mounted, wide-view mirrors provide both a level of convenience and safety. A simple glance gives you a clear view of what is behind you, perfect for when riding in groups. Plush two up seating with integrated backrest. Additional passenger comfort includes grab bar wind deflectors and foot rest blocks.